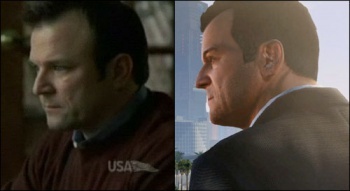 The Face of GTA V Is ... Ned Luke? Internet sleuths might have dug up details on the actor playing the main character in GTA V.
The excitement of viewing the first assets from the fifth Grand Theft Auto game has died down - probably because everyone is playing MW3, Saints Row or Skyrim - but that doesn't mean die-hard fans haven't been trying to track down details. Speculation on the 1.5 minute trailer was in earnest with many people excited about possible callouts to previous GTA games. The most plausible was that the narrator sounded a lot like Ray Liotta, the actor who played Vice City's Tommy Vercetti, as an older man, but careful investigation by fansites like GTAV.net and iGTA5.com exposed another possible lead actor. Ladies and gentlemen, I give you Ned Luke. Ok, it's perfectly acceptable for you to never have heard of him. According to his IMDB page, he hasn't appeared in anything other than bit parts and guest spots in TV movies and crime shows. But if you listen to his demo reel and compare his voice to the GTA V trailer, the resemblance is pretty damn clear. Plus, he looks a lot like the shot of the middle-aged criminal looking over Los Santos from a balcony. There has also been some confirmation via Twitter, sort of. Actor Jimmy Taenaka recognized his friend Luke from the trailer immediately and said on November 5th, "My fellow thespian Ned Luke is the lead voice and profile in the upcoming game by Rockstar Grand Theft Auto 5! Way to go Ned! Wholly Molly!" Taenaka said that his observation wasn't official, but he knows Ned Luke's voice and face enough to be pretty sure it was him. Ned Luke also participated in the #GrandTheftAutoMemories Twitter promotion run by Rockstar, and he subsequently deleted his account. Take that for what it's worth. The final piece of evidence is that Luke's IMDB page lists GTAV as a credit with him playing a character named Albert De Silva. Keep in mind, IMDB works similarly to Wikipedia in that authorized people can add or make changes to an actor's page at will, so the listing may not be accurate and most certainly does not come from Rockstar itself. On the other hand, this is the first mention of the protagonist's name, and if Luke is confirmed as the voice and likeness, Albert de Silva may well be the main character in Grand Theft Auto V.
It's on the internets, it must be real!